By now, it should be painfully obvious that I never need a good excuse to go searching for quality Chinese food, particularly when I’m near Atlanta’s Buford Highway. But when I receive an email with the subject line of “Dumplings!! !” and a link to an Atlanta Magazine article, things are all the easier. 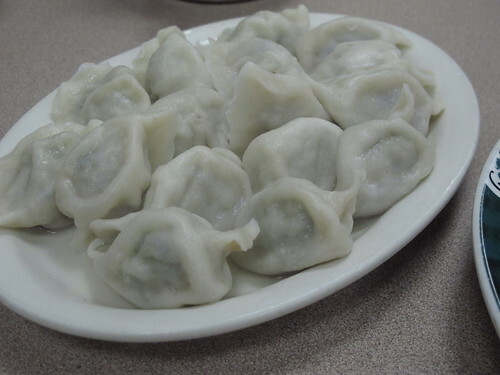 This time the article in question is a short guide to Chinese dumplings on Buford Highway. 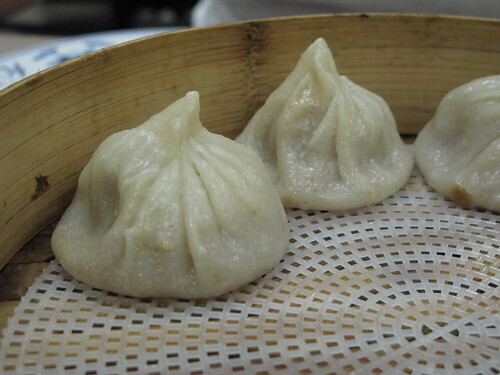 Written by Evan Mah of the blog Toothfish with guidance from Chef Ken Lim of Penang Atlanta, this five part article covers dumplings from five general regions of China. Since I’ve already spent a fair amount of time at Oriental Pearl, Chef Liu’s, and Gu’s Bistro, that left Northern China Eatery and Yen Jing unexplored. With those two in mind, it only took a few quick phone calls to see which was open and then Jennifer and I were on the way to Northern China Eatery for some late Tuesday night dumplings. If you look at Northern China Eatery’s Urbanspoon page, it’s pretty empty. Even the reviews from Blissful Glutton and Eat Buford Highway are three to four years old. I chalk this lack of press up to the restaurant’s location. Despite knowing my way around Buford Highway, it took a few tries before I spotted the restaurant’s sign and saw the front door tucked around the side of a strip mall. Once inside, the menu was much easier to navigate but there was sad news; both the fresh shrimp dumplings and the fried pork dumplings being unavailable. Consoling ourselves, we picked a few dishes and with our orders in, we could soon hear the sizzle of hot woks and the alluring sizzle of garlic and ginger. 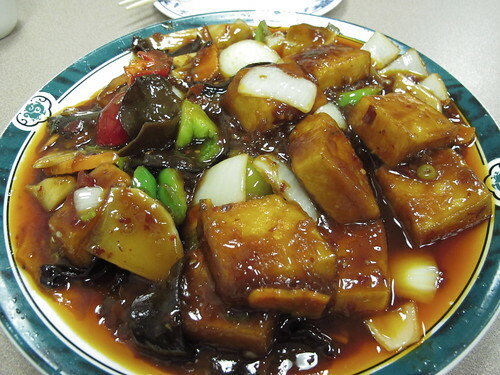 First out of the kitchen was an order of tofu in chili garlic sauce. 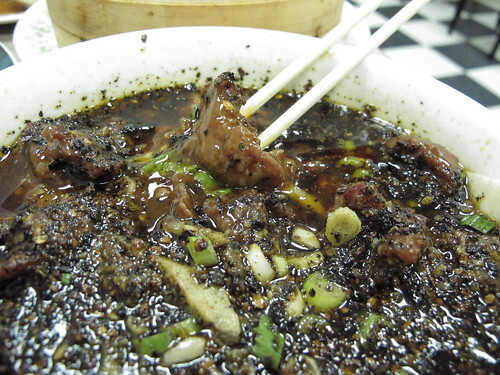 Despite the mouth watering smell of garlic and chilies, this dish was thick and oily. 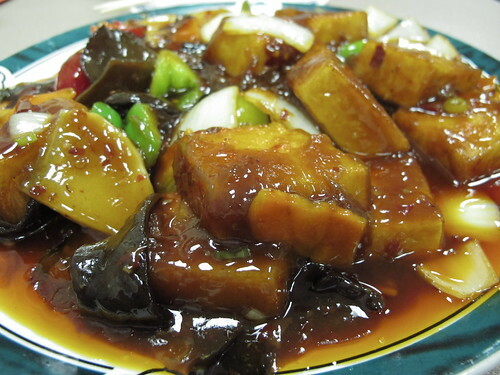 Battered with starch, fried to a crisp, and covered in a viscous, corn-starch thickened sauce, these tofu squares were still molten in the middle and deeply satisfying. Once I got past the oil slick on the sides and the greasy texture I couldn’t get enough of this dark, garlic packed dish. 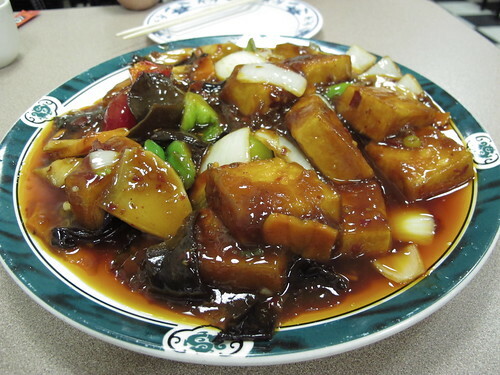 With each bite of firm tofu contrasting with the crunch of bell peppers and wood ear mushrooms, I found it hard to tear myself away to try the next dish. 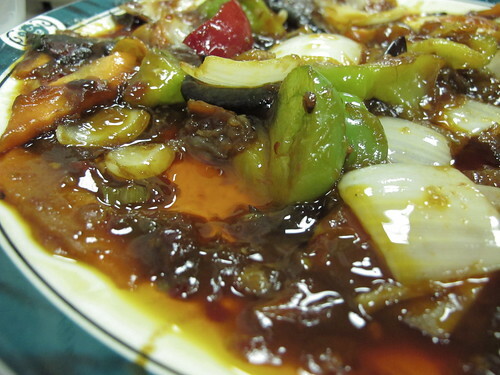 Seeing beef in chili oil on the menu, I was curious to see how a Northern Chinese restaurant would handle what I consider to be a Sichuan dish. 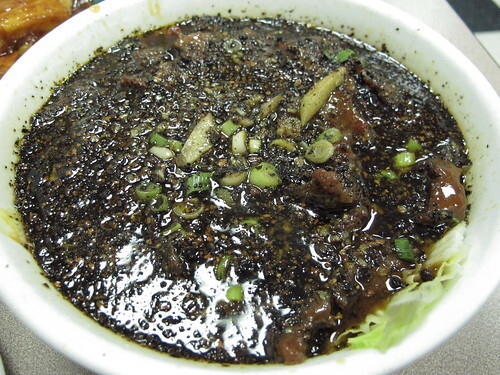 In lieu of dried chilies and Sichuan peppercorns, the velvety textured beef in this dish was swimming in a sea of sweet and fruity black peppercorns. 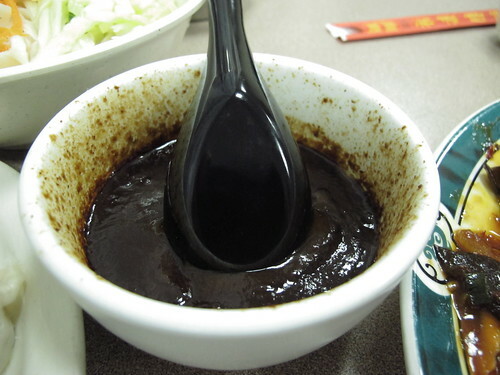 With the sweetness compounded by an even sweeter sauce, I was surprised at the lack of pungency to this dish. 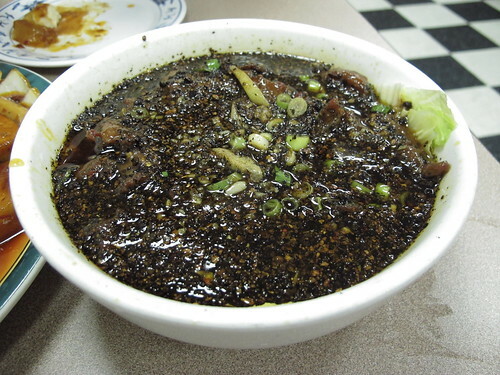 But the floral tastes of the peppercorns were almost as captivating as those of the “ma la” laced dish from the southwest. Of course, we couldn’t forget the reason we came to Northern China Eatery. 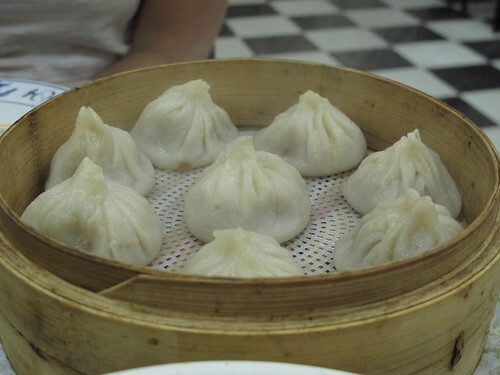 Soup dumplings, those Shanghai delights, were in fine form at NCE. The wrapper was a bit on the thick side, but these parcels held a piping hot dose of hot and sweet broth with a nugget of pork in the middle. Well served by a dose of vinegar, it’s hard to turn away from a good soup bun. Contrasting the sweetness of the pork soup dumplings, an order of beef dumplings was next. Like so many Chinese restaurants, NCE ranks high on the bang for the buck scale as this plate of dumplings was cheap as chips. The actual flavor wasn’t quite as captivating. Inside the thick wheat wrappers was a filling of beef, leeks, and green onions, but the flavors of these dumplings seemed washed out and diluted. Rounding out the meal was an order of sesame noodles. 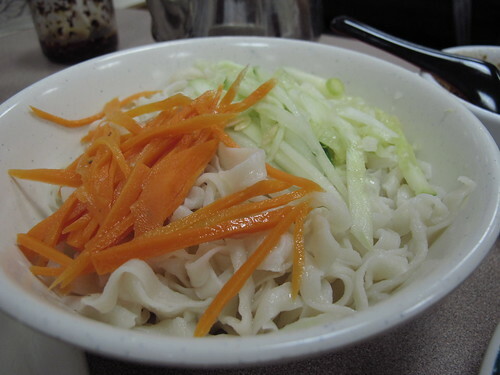 Served cold and unmixed, these wheat noodles were quite elastic. Following the trend, the sesame sauce was quite sweet. Trying to combine the noodles and sauce without making a mess was an issue, but at this point in the meal, there was little enthusiasm for cold and frankly lackluster noodles. As is often the case, we were staggered by the amount of food we received in comparison to the size of the bill, but we were also a bit disappointed that the main reasons we choose Northern China Eatery, the fresh shrimp dumplings and fried pork dumplings, were both unavailable. However, for the most part, what we were able to order was well prepared and immensely satisfying if a bit too sweet and greasy. Oiliness aside, I have to agree with Foodie Buddha that Northern China Eatery doesn’t get enough attention. Hopefully next time I can solidify my opinion and try the two elusive dumplings.